Capt. Pat McGriff spoke at the January 2011 meeting of the Gainesville Offshore Fishing Club. 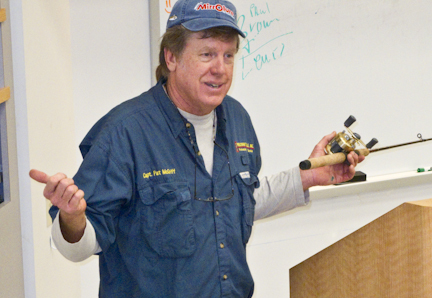 Pat is a very successful inshore fishing guide, based out of Keaton Beach, on Florida’s Big Bend, in Taylor County. If you’re targeting big trout in water that’s 55-degrees or less, stay close to shore in shallow water. Fish near warm rocky shores, oyster bars or mud banks. Fish in stained water, as it warms faster. Brackish water is usually warmer than Gulf salt water. Fish outside of bars and rock piles on a falling tide. Don’t get too close! The slow tides between the full and new moon cycles tend to keep the inshore waters warmer. Learn to ‘twitch’ your baits rather than ‘jerk’ them.